Meet Cybil in the Saloon and complete the Three Bridges to finish this mission. 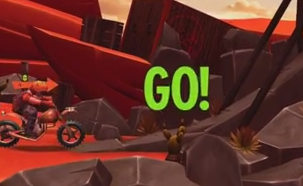 As you'll see in the video, this Trials Frontier mission gave us a bit of trouble. We're pretty sure we have a bad case of road rash... on our back. If you struggled as we did, check out how you can complete the Three Bridges to finish the mission.